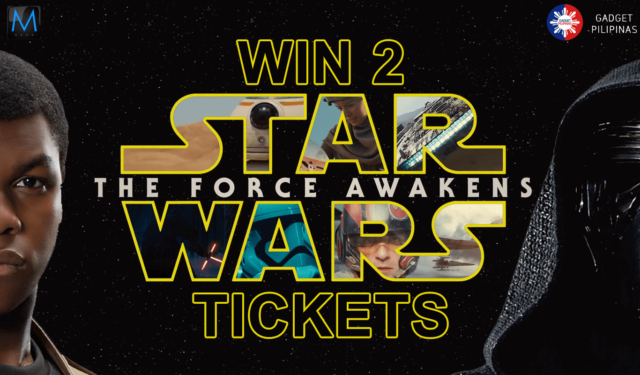 Here’s your chance to win 2 Star Wars: The Force Awakens tickets! Our friends at MacPower are very generous enough to provide us 7 pairs of tickets to movie block screening of Star Wars: The Force Awakens this December 18, 2015, 5pm at Cinema 2 of Bonifacio High Street Cinema. Star Wars: The Force Awakens is the 7th episode to the Star Wars saga. It is set 30 years after the Rebel Alliance’s victory over the second Death Star, and 29 years after the Battle of Jakku. The latter is a FREE playable DLC to Star Wars: Battlefront, which EA Dice developed. To join, you simply have to use the Rafflecopter widget below this post. Don’t forget to check out the mechanics too. We will draw 7 winners, and each will win 2 tickets each. Answer the question on our comments section: If you were a Jedi or a Sith, how do you want to be called? You may join the contest everyday to increase your chances of winning. You can only join once a day and also win once. Announcement of winners will be on December 17 at 12pm. This contest is open to anyone based in the Philippines. Prize is not convertible to cash. Movie tickets can be claimed on December 18th at the venue. Time and Venue: December 18, 2015 at 5pm in Bonifacio High Street Cinema. Click this if you can’t view the widget above.